What is Digital Transformation in Financial Services? This morning I was on the keynote panel at the FST (Financial Services Technology) Conference in Dallas, USA with the snazzy title of Digital Transformation. I was joined by three other panelists from Thomson Reuters, Wells Fargo and Discover. It was a lively debate, with some differing views and experiences. I thoroughly enjoyed the experience. In preparation for the conference, I put together my thoughts on what is Digital Transformation? There are many industry commentators who are putting every project into their Digital Transformation bucket (well, budget). And Transformation either starts with or leads on to Innovation – so what is Innovation? Digital Transformation is often achieved through an iterative approach, and puts the user at the centre of the system. The user can be an end customer, a B2B (another business), a supplier or a member of staff. I started putting my thoughts into a simple diagram, which is shown below, and it clarified my answers to the questions posed above. The diagram can be looked at column by column. Like most commercial models, there will be a balance of risk and reward, and the top row is the more disruptive and risky approach. The bottom row fits safer cultures or more risk averse organisations. The first column splits Digital Transformation into two business models – revolutionary and evolutionary. I will also add Consumer Identity as a revolution, even though it hasn’t been publicly implemented/ widely adopted yet. Consumer identity will enable retailers, financial companies and governments to know and trust who users are, just as much as a paper passport does today. R&D (Research and Development) facilities are designed to either experiment with new ‘stuff’, or they need to produce new products. Experimentation is about ‘trying’, without the pressure of success. Experimentation is difficult in corporate environments because it’s difficult to start with a measurement criteria of what success even looks like for an experimental project. NPD (New Product Development) is starting with the main aim of creating a new product from the current team. It begins with the expectation that the project will definitely result in a successful new product. Many senior managers, especially in the Financial Services industry, say they want to experiment although what they really want is the R&D team to create new products more quickly. What’s really needed is a healthy balance. There’s nothing wrong with experimenting with new technologies and concepts, playing with them, and seeing that perhaps they might be useful to your company. But ultimately your company needs to make money and is looking to improve existing products and create new ones. How an organisation builds an innovation function falls into two categories – either incubating small companies, mainly start-ups, or by creating a focussed R&D capability themselves. Incubation provides start-ups with the two most basic needs they need to survive/ flourish – funding and infrastructure. The funding is often simply an equity stake or cash incentive if the start-up succeeds. The infrastructure is the expensive office space and sometimes business support such as legal, commercial, HR and so on. The advantage of the incubation approach is that it attracts smart people to what is often perceived as a large, faceless, unexciting company. The disadvantage of incubation is that the very things (money and infrastructure) which keep start-ups hungry for success, are solved too early on for their own good – it’s killing them with kindness. Also, start-ups are nimble organisations which can change their business model, product and strategy overnight. However, the incubation process limits this because the start-up often needs to conform to the larger company which is trying to be their mentor. Finally, the incubation process is a throw-money-at-the-problem solution and it’s a numbers game. The strategy is to back a few companies and then see which ones survive. In an innovation lab, the aim is to set up small, high performance teams to experiment or solve problems inside the business. Setting the objectives for these teams are often one of the hardest parts of the innovation labs. The advantage of the innovation lab is that the teams are focussed on the business problems, not their own start-up. The disadvantage of an innovation lab is attracting the high performance people to work in the lab. It’s often difficult to attract candidates to the company – these people will often want to work for the ‘coolest’ company in town. Or, they already work in another part of the organisation and their division doesn’t want them to go. 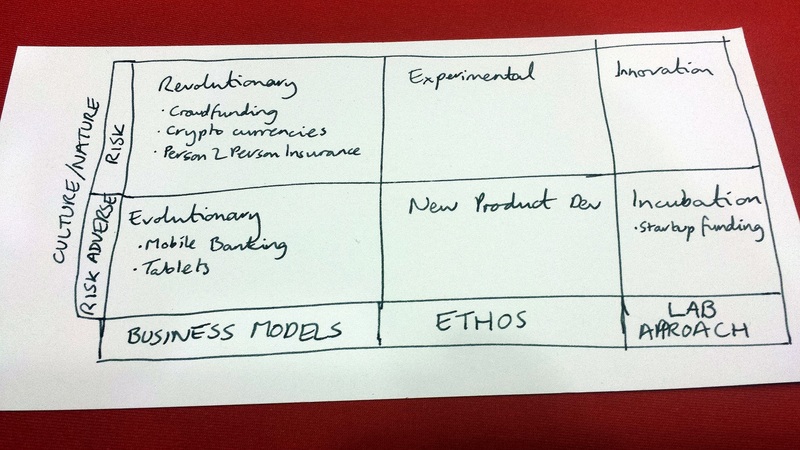 Whichever of these business models, ethos and labs approaches you choose to take is often based on the culture of the organisation. The more risk averse the organisation is, the more likely its innovation approach will align to the second row, evolving new products in a safe controlled environment. And often, this is adequate. Some of the oldest companies in the West are in Financial Services and have survived many global threats and competitors. The challenge is to how to making them to continue to thrive now that the barrier to entry for competitors is the lowest its ever been. Good post Bradley. Can you update your diagram to something usable in a presentation? I’ll still attribute it to you but I can’t use the handwritten version. Thanks Mark. As requested I’ve updated the diagram at the end of the post. Simply click on the picture to get the full size version.